As some of you know, I have started to write about the Haifa area. I can do this now that I am working from home and have the 4 hours of my day back that I used to spend commuting. Yipee. 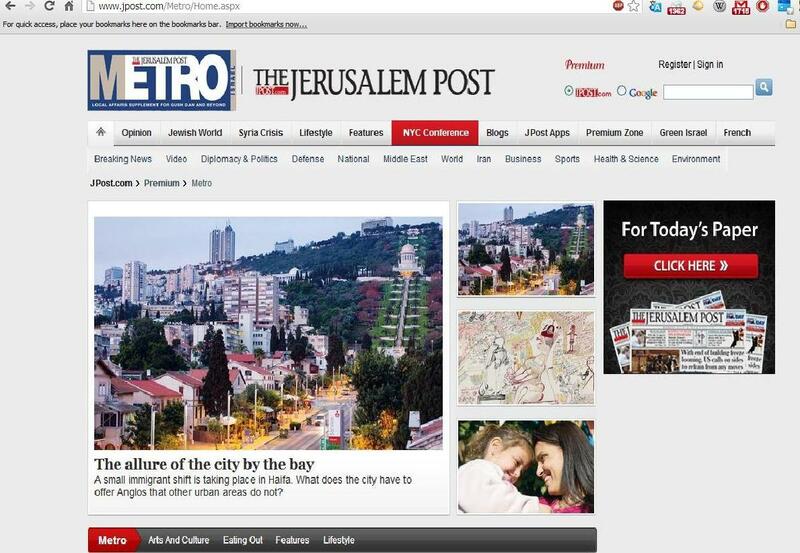 Here is my first piece, titled, “The allure of the city by the bay,” which I published in the Jerusalem Post‘s weekly metro section. It’s their top story this week! If you have ideas for pieces I can write about Haifa, the North, or about whatever, let me know. I’m looking to develop my portfolio considerably, so any ideas would be appreciated. Without further ado, here’s the piece, texted below so that you can read it beyond the paywall (sshh). A small immigrant shift is taking place in Haifa. What does the city have to offer Anglos that other urban areas do not? Many would say it is hard to find English-speakers in Haifa – that although one can hear English spoken occasionally in public, it does not happen often. So it may come as a surprise that there are over 700 members of the “Haifa Young English Speakers” Facebook group. At an HYES pub night recently – an event held once or twice a month – several dozen people crowded into the dimly lit, cozy student bar and restaurant Nola Socks, located near the Technion-Israel Institute of Technology. It was a diverse and well educated group. Many studied at the Technion. Several were postdoctoral students. Quite a few were new immigrants, only one or two of whom wore kippot, though there were some Israelis there as well. According to statistics from Nefesh B’Nefesh, there is an immigrant shift taking place: More Anglos are coming to Haifa. Since 2008, the number of North American and British immigrants who have moved to the northern city has tripled. In the same period, the number of olim from those countries has not even doubled. However, this movement is small. According to Smadar Stoller Porat, the city’s project director of immigration for olim from English-speaking countries, the total number of English-speaking olim living in Haifa is around 2,600. What is Haifa starting to offer Anglos that other urban areas cannot? Put simply, it’s cheap and beautiful. Rental apartments cost around half what they do in Tel Aviv, and unlike in Tel Aviv and Jerusalem, many apartments in Haifa have views. If you want a San Francisco-like view from your apartment and a more affordable quality of life, Haifa delivers. MOLLY MULLIGAN, a 30-year-old American postdoctoral student in biomedical engineering at the Technion, is HYES’s social activities coordinator. Raised Christian but now secular, she came to Israel because a doctoral mentor urged her to work with his colleague at the Technion. Asked if she plans to stay in Israel after her postdoc is done, she says she wants to if she can. “I would like to stay, but I have to see if I can get a work visa. The level of work being done at the Technion and the companies I’ve had interactions with is just very high,” she says. Aside from sometimes being mistaken for a Russian, Mulligan barely mentions encountering any difficulties. In contrast, Diana Polansky, who made aliya five months ago from New York, seems less certain she will stay in Haifa. The 33-year-old Polansky says she doesn’t know if she was sold the truth about the city as an ideal launching pad. Indeed, this is the key reason Haifa is cheap: Beyond the Technion, the University of Haifa and the hi-tech industry there are fewer lucrative job opportunities than in the Center. And even though Kevin Mayer – a 33-year-old Australian immigrant to Haifa – is an engineer, he thinks he will probably move to the Center of the country. “I’m looking both in the Center and in Haifa. She has less to say about what benefits the city may have for singles. This family-friendly atmosphere was one of the factors that motivated 39-year-old Josh Turner, his wife, Revital, and their two children to make aliya a little over two years ago from Canada to Kiryat Bialik, a short drive away from Haifa. He says he appreciates what the area has to offer and thinks it’s a pleasant, affordable place to raise a family. Australian immigrant Tanya Ford, meanwhile, lived in Tel Aviv for more than four years before recently moving to Haifa to live with her Israeli boyfriend, and she feels there have been many benefits to the move. “It’s a lot cheaper than living in Tel Aviv in terms of rent. In my field, which is engineering, there is a lot of work available here. And it’s beautiful – it reminds me of Sydney,” she says. However, she cannot see Haifa becoming a hub for new immigrants, as there simply aren’t the numbers for it. Annette Cohen, a religious woman who made aliya from the US in the early 1960s and has lived in Haifa ever since, sums up what is good about Haifa for Anglos: more interaction with Israelis and with nature.